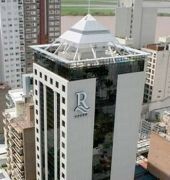 Ros Tower is a 5-star hotel close to the Parque Nacional de La Bandera and the Parana River. It offers a climatized roof-top pool, luxury spa facilities and panoramic views.Ros Tower Hotel Spa & Convention Center provide rooms that are spacious, modern, and include LCD TVs. All offer scenic city views.The hotel’s Spa & Health Club includes an indoor and outdoor pool, lounge areas, and a variety of water and body treatments.Ros Tower is a 30-minute walk away from the Casino. Guests are situated walking distance from de Flag Memorial and a few metres from the Parana River and the Cordoba pedestrian street.